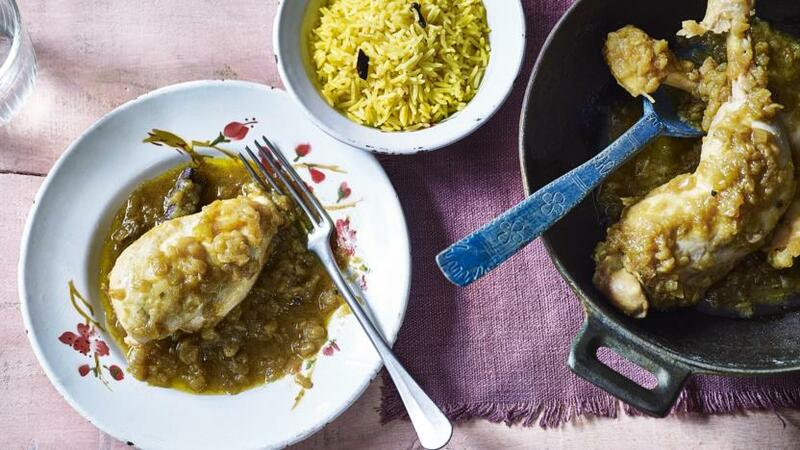 This slow-cooked chicken korma is more authentic than the rich restaurant style. The sweetness comes from caramelised onions rather than cream. Blend the garlic, ginger, vegetable oil and 4 tablespoons water to a purée in a food processor. Heat the ghee in a heavy-based saucepan over a medium heat. Add the garlic and ginger purée and fry for 1-2 minutes, then add the cardamom pods, bay leaves and cinnamon sticks. Add the onions and fry for 4-5 minutes, or until slightly browned. Add the salt and 500ml/17fl oz water. Bring the mixture to the boil, then reduce the heat until it is simmering. Half-cover the pan with the lid and simmer for 12-15 minutes, or until the water has nearly evaporated. Stir the onion mixture, then add another 500ml/17fl oz water. Simmer, half-covered, as before, for 12-15 minutes. Repeat this process 5 more times - this draws all of the natural sweetness from the onions and helps break them down to sweet and silky sauce. Serve in bowls with steamed pilau rice.